When you hear a word like “Rapportive,” you don’t know what to make of it… Is it a slang term for a rap artist? Is it a new military communications network? Is it a new kind of sandwich spread? Well, let’s quit guessing and just find out what the devil it is. It’s a new company with a new product with a lot of buzz. Rapportive began in January of this year, and already people in the tech world are talking about how it “makes Gmail more useful.” It’s a free downloadable program that attaches to your Gmail account and shows you everything you might need to know about all those people sending you emails (whether they are your contacts or not). A sort of CRM for e-mail. You can immediately see what people look like, where they’re based, and what they do. You can establish rapport by mentioning shared interests. You can grow your network by connecting on LinkedIn, Twitter, Facebook and more. And you can record thoughts for later by leaving notes. Rapportive shows you everything about your contacts right inside your inbox. No external links, no opening up another tab or browser. Imagine relationship management built into your email. For free. Rapportive also accepts feedback from clients and uses that to improve. One of the frequent comments is something along the lines of “displaying an informative and helpful profile when companies email me.” Typically, when you get an email, Rapportive tries to find the sender on social networking sites, and give you a summary of that person. However with companies (which account for a lot of the e-mail messages out there!) you can’t always find out their information on social networking sites, so Rapportive has taken this opportunity to also create company profiles, so people can read about what kind of companies are sending messages before they subscribe to any newsletter. Pretty rad! 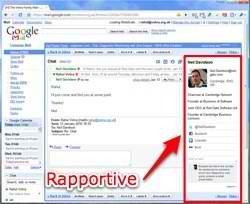 Rapportive is definitely worth checking out, it’s free, easy to use, and works right alongside your Gmail account.